A fantastic three points yesterday – I said in my Preview article that I felt confident going into the game, despite our recent lack of wins at Craven Cottage, and I was pleased to see Redknapp a) go with Pavlyuchenko, and b) make a very positive half-time substitution, bringing on Lennon for Sandro, and shifting Modric inside; he was poor in the first half, and much improved in the second as a result of this switch. It was a fairly even affair, with Spurs dominating early on, before Fulham came back into it. In the second half, Spurs had more control of the game, especially after Murphy went off injured. However, despite our control, we could easily have conceded on a number of occasions – mainly from set pieces, but also when Kamara swept over, and when Dempsey got beyond Gallas, but was adjudged to have fouled him. Gallas hasn’t had the best of starts to his Spurs career – at fault for West Brom’s goal at the Hawthorns, and at fault again yesterday. He looks so comfortable on the ball, and seems to cruise through matches, but tends to make some baffling defensive decisions. The goal was one such case, but the incident where Dempsey fouled him was another prime example – Dempsey needn’t have done so, Gallas was beaten. Simon Davies picks up the ball in the middle of the park – Sandro has pushed forward, following the ball rather than closing off the angle for the pass. Our defence is holding a high line, but Davies clips a ball forward to Dempsey – Hutton has tracked him, but is neither goal side, nor tight enough to him to be able to influence him. Notice Kamara making the run off him. King comes back to help Hutton out, and between them they force him wide. Gallas is struggling to keep up with Kamara. It looks like the situation is under control – Gallas is relatively well positioned for a cross, and King should be able to block any potential shot. There is no support arriving from midfield. As Dempsey swivels, Gallas takes a big stride towards goal – why he does this is anyone’s guess, I presume he’s trying to block any potential shot. Unfortunately it just leaves Kamara able to slot home from close range. A really bizarre decision from Gallas in my opinion. Absolutely. He was caught ball-watching and looked not only naive, but petulant as he ranted at his team mates despite being most at fault. How long before his first mid match, sit-sown protest and hissy-fit? In his slight defence- moving to block the shot wasn't totally stupid, it did seem the most likely option for Dempsey. And I thought the cross took a nick off Hutton's heel as it went through his legs, enough to divert the ball out of Gallas' reach. But had he stayed closer to Kamara, they wouldn't have scored, it's true. Still- do Milan have anyone like Kamara or Dempsey up front? Thought not. I was surprised that Gallas didn't cut it out ,he was clearly back on his heels. It was mishit quite slowly across goal. We didn't play that well except in patches but won for the third time after going behind. Bold tactics by Harry, Is he getting the hang of this tactical thingy? Hutton's fault not gallas u mongusses. One thing I pondered was how ridiculous our bench was - Kaboul, Palacios and Corluka couldn't even get on it. Rotation will be important and to that end it was good to see sandro starting. Quite a good day for our loanees yesterday - with Caulker on the scoresheet, M'poku having an apparent stormer, Walker getting rave MOTM reviews, and our ipswich boys acquitting themselves well. Shame Parret and Bostock are having a more difficult time of things. Am I the only one who still has grave reservations about are defending.We look great going forward, although we don't score enough goals, but from set pieces we always look vulnerable and why do we always let teams come onto us in the last 15 mins when defending a one goal lead. With better finishing Fulham would have at least equalised. Our midfield are not the greatest at defending (without Palacios at his best) so it was good to see Sandro get his chance, but we need a solid defence. Gallas isn't good enough we need Daws back ASAP. yo_daniel - at the expense of leaving Kamara unmarked? 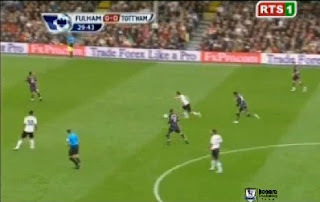 King had narrowed the angle, Gallas should have had faith in Gomes IMO. JimmyG2 - big credit to Redknapp for the change yesterday. Pebble - promising, isn't it? I'll aim to work on another loanee watch at some point soon. Anonymous @ 13:34 - I personally think our unsettled back 5 is the reason behind our lack of clean sheets. We certainly missed Crouch when defending set pieces yesterday, but the disorganisation that led to Kamara being unmarked 6 yards out was worrying. daniel is right. Imo, gallas would have been right in the path of that ball if not for a knick off of hutton. interesting how no one said anything of hutton being caught in a no-man's-land and made himself totally useless, and in fact he obstructed gallas' view, so when he saw the ball it was too late to react.